Instrument transformers (ITs) are designed to transform voltage of current from the high values in the transmission and distribution systems to the low values that can be utilized by low voltage metering devices. There are three primary applications for which ITs are used: metering (for energy billing and transaction purposes); protection control (for system protection and protective relaying purposes); and load survey (for economic management of industrial loads). Depending on the requireinents for those applications, the IT design and construction can be quite different. Generally the metering ITs require high accuracy in the range of normal operating voltage and current. 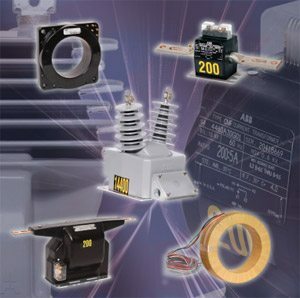 Protection ITs require linearity as a wide range of voltages and currents. During a disturbance, such as system fault or overvoltage transients, the output of the IT is used by a protective relay to initiate an appropriate action (open or close a breaker, reconfigure the system, etc) to mitigate the disturbance and protect the rest of the power system. Instrument transformers are the most common and economic way to detect a disturbance. Typical output levels of instrument transformers are 1-5 amperes and 115-120 volts for CTs and VTs, respectively. There are several classes of accuracy for instrument transformers defined by the IEEE, CSA, IEC, and ANSI standards. Figure 1 presents a conceptual design of CTs and VTs. Figure 2 shows how the polarity markers are used to keep the direction of current flow as the meters exactly the same, as if the primary circuit was carried through the meters. Grounding of the secondary circuit is most important, but in complicated three-phase connections, the best point to ground is not always easily determined. A The current transformer is designed to connect in series with the line to transform the line current to the standard 5 amperes suitable for the meter or relay. The voltage transformer is designed to connect in parallel with the line to transform the line voltage to 115 or 120 volts suitable for the meter or relay. To keep the voltage at the meters and relays at a safe value, the secondary circuit must be grounded. B The polarity markers indicate the relative instantaneous directions of current in the windings. The polarity, or instantaneous direction of current, is of no significant difference for current-operated or voltage-operated devices. Correct operation of current-current, voltage-voltage, or current-voltage devices usually depends on the relative instantaneous directions. Instrument transformers are special types of transformers intended to measure currents and voltages. The common laws for transformers are valid. This equation gives current transformation in proportion to the primary and secondary turns. A current transformer is ideally a short-circuited transformer where the secondary terminal voltage is zero and the magnetizing current is negligible. This equation gives voltage transformation in proportion to the primary and secondary turns. A voltage transformer is deally a transformer under no-load conditions where the load current is zero and the voltage drop is only caused by the magnetizing current and is thus negligible. I need an AC current to voltage transformer 2A to 5v ? Do you have something on the shelf (even close to that ??) or it requires special design?? I can help you with your inquire. Please send me more details, or please provide your contact details. I want help in getting electrical autocad .plz give me idea about it how can I download.